Friends and family of the stabbed teenager Jaden Moodie have paid tribute at his funeral to the 14-year-old who was "brutally taken from us". Jaden was stabbed to death by attackers who knocked him off a moped in Bickley Road, Leyton, on 8 January in what police described as a targeted attack. He had moved to the capital for "a new start", a youth worker told the BBC. Ayoub Majdouline, 18, from the Wembley area, has been charged with Jaden's murder. He remains in custody and his trial is scheduled to start at the Old Bailey on 8 July. Image caption Jaden's family remembered his loving, "cheeky smile"
As mourners waited for Jaden Moodie's coffin to arrive they stood outside listening to the beat of Nyabinghi drums. The mood was sombre, there were hundreds of friends and family, and many teenagers were being consoled as they prepared to say goodbye to their friend. 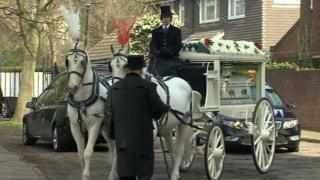 Traditional funeral outfits and personalised "Jaden" T-shirts were accessorised with orange items of clothing, because orange was Jaden's favourite colour. A horse-drawn carriage arrived carrying the coffin and eventually everyone walked, many arm in arm, into the church to the chants of the drums. In the church, friends and family paid tribute to the 14-year-old; his sisters spoke about a loving boy with a "cheeky" smile; and said he loved boxing and bikes. His grandmother reminisced about times she spent with Jaden and became emotional when she spoke to mourners. In his message, pastor James Powell called on people to "save lives and ditch the knives".